It seems like I want everything this year. Of course, that is not going to happen so I have picked out my top choices. What do you all want this year? These CatBird twisted snake earrings are just what I need to add to my jewelry collection. They are simple, yet totally unique and at $55, they are a steal. I have been searching for the perfect fur vest for awhile now and found it in this Urban Outfitters faux fur vest. It is the perfect length and so versatile. Dress it up or down for an eclectic, beautiful style. These Madewell sidewalk skimmers are so cool in glitter. Perfectly comfortable yet ultra-chic, I need these in my shoe collection. I am a huge fan of Michael Kors handbags and this large Grayson satchel is right up my alley. Simple and classic, this bag could fit all my goodies. I am always trying to spruce up my apartment and keep it fresh. This Urban Outfitters Ava tufted sofa would completely add a new element to my living room. Santa, can you help me out? I wanted to introduce you all to Nyopoly! Nyopoly is a members-only shopping experience where every price is personal. 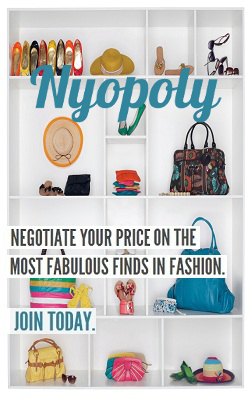 With Nyopoly, you negotiate your price on the most fabulous finds in fashion, getting coveted styles on your terms. Nyopoly is like walking in to a store, grabbing an item off the shelf, and determining your purchase price with the cashier. It's not an auction, and you're not competing against anyone. It's personal. Nyopoly and I are giving away a $50 credit to one lucky reader. All you have to do is request an invitation here and leave a comment on the blog. Entries must be received by December 12th. MiniLuxe is by far my favorite place for nails and waxing in the city. Not only is the decor simply adorable and inviting, but they are pros at what they do. Join MiniLuxe tomorrow night for a fabulous Stella & Dot Jewelry Party! Please join me at Neiman Marcus on December 5th from 5-8pm where I will be styling outfits from head to toe from the amazing selection in the CUSP salon! I would love to see you all there! Give the gift of Tiffany and Co. with this adorable, simple bauble. The Tiffany 1837 Bar Pendant is perfect for wearing alone or layering with other necklaces. Delicate and classic, it would be a wonderful addition for under the Christmas tree! I am lucky enough to have this gem and I absolutely adore it. Special thank you to Tiffany and Co.! Run! Don't walk to this amazing collaboration by Target and Neiman Marcus! Get in line at Neiman's this Saturday starting at 6 am. ANNOUNCING A BEVEL + BOSTONSTYLISTA GIVEAWAY! Today is the official launch of Bevel Jewelry and to celebrate we are giving away a piece of jewelry to one lucky reader! To enter, tell me how you would accessorize a piece of jewelry with your favorite outfit! Also, like Sarah McManus Styling on FB! Bevel has many talented designers but the force behind Dorus Mhor jewelry is the talented Liz Bloom. Her jewelry is inspired by metal sculptures and textiles. She handcrafts each piece with selected fabrics around the world. Each season involves using the Liberty of London Art Fabric collection which back in the 1890's were the best 'avant garde' textile designs. Liz Bloom is a Scottish born designer who grew up with one grandfather a silversmith and the other an expert in weaving. Her mother was a dressmaker who taught Liz at an early age. Later on, she graduated with a Fine Art degree in sculpture. Upon a six month sabbatical, Liz met a button maker and her vision began. From buttons to bead making, Liz incorporated fine, delicate fabrics and hence her line was born. She has had great success in London with fans like Florence Welch. 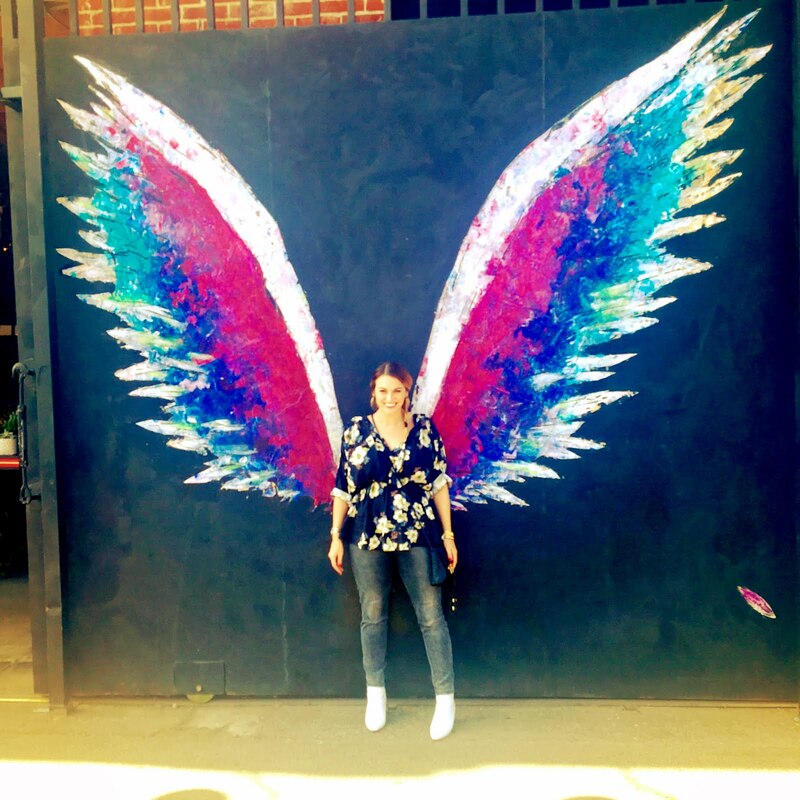 Now in Chicago, Liz works out of her studio creating gems for us all to adore. The name Dorus Mhor is a tribute to her childhood home meaning "great open doors". Right now, you can sign up for the Bevel waitlist - the higher you are on the list, the earlier access you get to the shows! 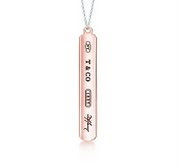 Bevel Trunk Shows announces the launch of their jewelry e-commerce website (www.BevelTrunkShows.com), bringing the designer trunk show concept to an online platform. An idea that has existed locally offline since the beginning of commerce, but never on the web, Bevel provides users with an unique first look at new collections from independent designers. I am proud to be affiliated with this unique company! Their designs are totally fun and original! Here are a few sneak peeks. How it works: Each designer creates a sample collection consisting of 10 exclusive designs and 200 pieces to be shown on Bevel for 7 days. At the end of the 7 days, designers hand make product, ship to Bevel and Bevel ships to end customer. Free returns, free shipping. Launching the week of November 28th, sign up for the wait list here to gain your access! 1. Divide your hair into two large sections, parting straight down the middle. For a sharper look, you can use a comb to part your hair evenly. 2. Pull a thin strand of hair from the outside of the left section. Pull it over the top of the left section, and grasp it under the right section. Basically, the strand of hair has gone over the left section and finishes under the right section. 4. Keep alternating sides, weaving over and under, until you reach the bottom of the braid. 5. Tie off the end with a hair bobble or elastic. I am always one for helping a good cause so when I discovered these bracelets I just had to have them. Not only are they super adorable but they support "Empire ded Enfants" in Senegal helping homeless children. They are made in Mali of recycled rubber by the women who live there and come in all kinds of colors. Pick up your stack over at M.Flynn Accessories in the South End. Fall is here and most of us are finding it hard to transition our wardrobe. I opt for light sweaters and T's paired with my favorite shoes and jewelry. It is all about taking pieces from your summer wardrobe that can be mixed in with your attire now. Try shorts with tights paired with a fall boot or your favorite tank under a light cardigan. It's all about how you mix and match. The last show of last night was Maria Victoria by Victoria Dominguez. She was born in Uruguay and graduated from the School of Fashion Design in Boston. Her clothes are sleek and ultra-feminine with a mix of solids and prints. The models looked hip with messy buns. I loved the sexiness of this show and the European feel it had. The pop of red added an unexpected touch! How hot is this number?! This was such a unique pattern. Holy LUKE AARON! This show was perfection! I enjoyed every second! The collection was inspired by Mid-20th Century silhouettes in Japan. The shapes were so elegant and feminine with origami folds and gorgeous draping. The materials consisted of organza, chiffon, and satin in the most beautiful yet subtle shades. They are perfect for a wedding or night out on the town. Schedule an appointment with Luke at www.lukeaaronboston.com. How fabulous to wear to work and then going out on the town?! The way this skirt fell and moved was so beautiful! A definite nod back to old times! Can't you see a bride walking down the aisle in this? This number was MY FAVORITE! I just adore this elegant, yet detailed silk gown. I want one for myself! Anything with shorts is cool to me! The final gown was PERFECTION! Look at the all the different shapes. It was as if Cinderella was walking the show!